Mavic has made some good wheels in the past. On the whole, they may not disappoint with the new R-Sys Wheelset. However, I also don't see much point in its carbon fiber spokes. Something more controversial is their cross section. A bicycle wheel typically has 24-30 spokes and while in movement they churn the air. The R Sys's bigger and rounder spokes depart from the norm in thinking about aerodynamics. What you end up getting is an expensive but stiffer wheel which eats a bigger percentage of aero drag than its cousins. Chris pointed me to a Mavic wheel "explosion" after a crash during Stage 1 of the Tour Down Under. This bike was ridden by Karl Menzies. 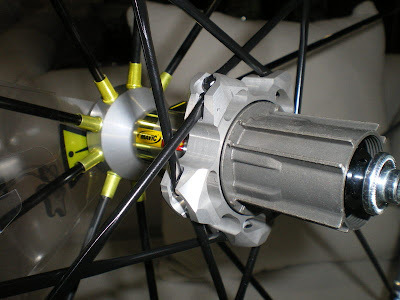 Notice that the wheel has detached from the hub and the spokes jut out in a unique fashion. I wonder whether low spoke tensioning had anything to do with this. The wheel doesn't appear bent but its hard to see from this angle. The photo was probably taken while the crash was happening (with a broken wheel before rider touches the ground) but the more optimistic of you might say that he's beginning to get up on his bike. Does anyone know how the crash happened? There was another picture (apparently lost in cyberspace) of a crash involving a rider at this years Pace Bend Race(Texas). It showed his damaged R-Sys wheel in a very similar condition as the picture above. I hope these riders are doing fine and back on their bikes. Human life values more than any combination of metal, nuts and bolts. Again, I'll take it that these types of failures are rare and the wheelset won't upset most people if rode safely. Take note. 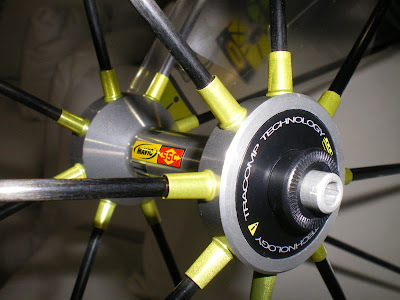 Front wheels of Mavic R-sys have been recalled as of Jan 5, 2009. To read more, click here. Ironically enough, you type "R-Sys failure" without the quotes into Google Images search, you get Chris's picture haha. Anyways, to me it seems like the rider in that picture is trying to get back up after falling over. If you look at his right leg, it is trying to push him up, probably just to snap his left foot out of the left pedal that is still stuck in. I don't think you could get into that position while you're falling, but I have seen weird things happen before. Yes I would say he's on his way to standing back up. It almost impossible to be on that side of the bike on the way to the floor. Funny how things get messed up the chain is on it's way off too but was on the big ring by the look of the D.
Maybe someone has the screw out of his cleat. Ron - that is a Graham Watson photo. The caption read that he hit a plastic pole or pilon and that caused the wheel failure. To me, it doesn't matter what he hit. Wheel damage is one thing, but these kind of failures are something of another magnitude. I will not be shelling out a grand for a set of these. Doesn't matter what you're riding, if you hit something big even Open Pros with 12 gauge spokes will explode. I just crashed my brand new Super Six with R-SYS wheels at 30mph (cool stats on my Polar; 31 mph to 0 then HR up to 210!) and spent 4 hours in the ER. Car bumped me so I hopped a curb and crashed on gravel, bike ended up 20 yds away. Both wheels are perfectly true with only 1 damaged carbon spoke in the rear probably from my foot. Frame and everything else held up but brake levers are goners along. In most scenarios these wheels should be as strong or stronger than similar weight traditionally spoked wheels. Well let me call nerd alert on spokejunky - what about the guy in the 1997 Giro who hit a car at 50 and didn't have a scratch and wheels were intact? 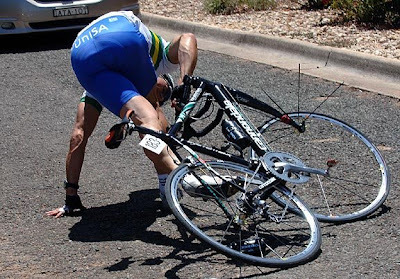 Spend some time at a velo and sooner or later you'll see some alu wheels collapse in a sprint and spokes go through tires - weird stuff happens. Every crash is unique, nerd patrol. I hit the ground at 30 mph, destroyed my shoulder but the only damage on my brand new SuperSix was a scuffed left lever and two broken rear spokes - totally freak results. Cannondale rep said frame is 'probably' fine but because I crashed it no warranty etc so crash replacement here I come. In my case my wheels didn't hit anything hard but if I hit the car or curb instead of going around and over sure my wheels would be history. Two years ago I got bumped in a race, hit a huge pothole while climbing at 15mph and bent a steel frame, destroyed 2 Open Pro rims, and tore off my rear deraileur and walked away with minor road rash. If you hit something hard enough to separate you from your bike by 30 yards I can tell you from experience it doesn't hurt any less if your spokes stay together. My R-SYS wheels feel rock solid but no matter what I'm riding I have no expectation of it staying together if I hit something huge. The photo definitely looks like Photoshop for sure. I can say this though. I bought Mavic R-sys wheels two weeks ago and just did a century ride yesterday. I did hit some bumps on a couple of descents but nothing really bad. Today I went to go check out my bike and cruise it around the neighborhood. Low and behold, the front wheel is warped? WTF? I am not sure when this actually happened, but I can tell you that I did not notice it during the ride at all. Maybe this was because it was 98 degrees and I had other things to worry about. If it did happen when where I think it did, then I basically rode the last 44 miles or so with the wheel like this. I am also 6 foot 2 and 230 lbs. This was the main reason I went with the R-sys. I did buy the warranty as well so we will see what happens. At this point, I really do not know what to think at this point. Maybe it needs to be trued? I will find out more tomorrow. I saw the same failure on a group ride when a rider bumped his rear derailleur into the R-SYS front wheel of another rider. Normally the rider could have recovered from the bump with a bent or broken spoke but the R-SYS saw one spoke go first and all the others followed suit in what looked like an explosion of carbon fiber. Scary stuff. If you look closely, you'll see that the rider's left foot is still clipped in. I don't know about you guys, but after I crash, I don't remain clipped in while trying to get back up. I unclip, dust off, check my skin and bones, then worry about my bike. I think this picture is of the rider crashing. He must have known he was going down and threw his right leg over his frame to brace the fall. Interesting. I'll still use mine for training when they get back from being reworked.